Title link takes you to the original site in Japanese. Here's a link to the Google translated version. 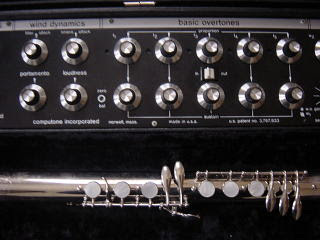 "“performing in the orchestra, was the idea like the electric flute which is audible sufficiently in the hole”, so is. It has started from the place where it tries probably to reproduce the performance method of the wooden bobbin musical instrument and the constitution of the timbre electrically. Being afterwards, appeared, become constitution of the general analog synthesizer VCO, VCF and VCA…. whichWith there is no similar point yet, changes harmonic overtone constitution and on the other hand, it can call with the point which does the sound making that it has been similar to [dorouba] of the organ. At this point in time as for [ririkon] of the first generation [ririkon] II which it mentions later, formation differs from [doraivua] completely." board in the world: check out the circular array of photocells!"